The installation ceremony of Norcliffe Lodge No 7371 was a particularly grand installation ceremony for Neil Kirkpatrick. Neil was initiated into Norcliffe lodge some 26 years ago and has made a steady journey to the chair of King Solomon during which time he has received a Provincial appointment to Past Provincial Junior Grand Deacon. Stuart Thornber (left) congratulates Neil Kirkpatrick. Stuart Thornber, the representative of the Provincial Grand Master, was supported by no less than eight grand officers; Peter Greathead North Fylde Group Chairman, Harry Cox, Duncan Smith, Keith Jackson, Geoff Pritchard, Brian Parkin, Eric Picton and Stephen Townsend and they were accompanied by acting Provincial grand officers John Pitches and John Burgess. 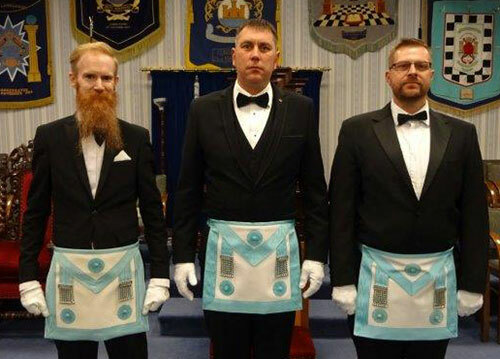 Dean Roskell as WM opened the lodge and completed the first part of the business with great skill, after which Stuart and the accompanying officers paraded into the lodge keenly watched by DC Neville Smith. 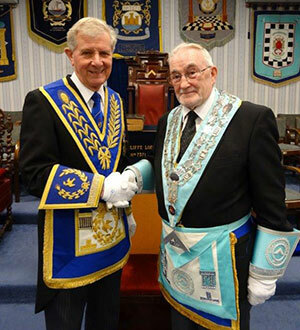 Stuart was formally welcomed to Norcliffe Lodge by Dean at which point the WM presented cheques to Stuart; £500 for Prostate Cancer, £500 for the Alzheimer’s society, £500 for the British Heart foundation, £500 for West Lancashire Freemasons’ Society and £3,000 to the MCF 2021 Festival. Members of the lodge and visitors have donated an additional £157 in the Festival envelopes during the past year. The huge amount of £5,157 has been raised for good causes. Stuart thanked Dean and the members of the lodge for their hard work in raising such a magnificent sum. Dean promptly proceeded through the second degree to then open the lodge in the third. He requested Peter Greathead to assist him by occupying the senior warden’s chair. Brian Parkin acted as installing junior warden and the WM of Spartan Lodge acted as installing inner guard. Dean installed Neil into the chair with aplomb. The brethren were extremely impressed with the presentation of the working tools by three ‘light blue’s’ of the lodge. David Ollerenshaw presented the third working tools; Matthew Brady presented the second tools, the set being completed with Ryan Gleeson’s presentation of the first degree tools, proving that the future of the lodge would be in safe hands with such talent. Brian Parkin presented the address to the master, while Bob Leonard addressed the wardens with style and Stuart Thornber’s impeccable address to the brethren of the lodge completed the installation addresses. At the close of the installation, Stuart rose to bring the greetings of the Provincial Grand Master Tony Harrison to Neil and said that he was sure that Tony would have been impressed by the hard work of Dean during the installation. He said also that Tony would have also been extremely happy to see the amount that had been raised and donated to charity adding that Tony would also have taken the time to congratulate the three ‘light blues’ who presented the working tools. Later in the evening at the festival of St John, the brethren were treated to fantastic food and excellent company. 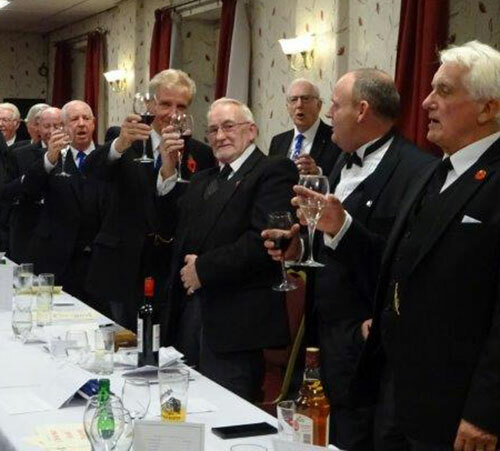 Stuart, in response to the toast to the grand officers, thanked the lodge secretary and Peter Greathead for their hospitality and wished the new master a happy and healthy year. Stuart congratulated John Pitches and John Burgess on their Provincial appointments and for their support and hard work. Stuart continued, to recommend the Royal Arch to any of the brethren who were not yet members and thanked the brethren for their continued support of the MCF 2021 Festival. Following the toast to his health Neil was treated to the master’s song with true style by Hugh Mett whose rendition entertained all present. The raffle held at the festive board raised the magnificent sum of £301, which no doubt will go into the charity coffers and provide a great start for next year’s master to present. Immediate past master Dean Roskell and partner Sam, a few days later, were pleased to present the cheque for £500 to the Alzheimer’s Society office in Blackpool to manager Janet Holmes. At the British Heart Foundation shop, they were also warmly greeted by area manager Georgina McCann and shop manager Joanne Farrell when they presented another cheque for £500. Freemasons supporting their local community. Picture left: Sam and Dean Roskell presenting a cheque to Alzheimer’s Society manager Janet Holmes. Picture right: Sam and Dean presenting a cheque to British Heart Foundation area manager Joanne Farrell.